Alexander McCall Smith has written so many different books that I’ve loved reading — Dream Angus was a wonderful retelling of the Celtic myth; I eagerly await each new volume in his #1 Ladies Detective Agency series; and I have just discovered that he has written a new little series of books for young children that will be perfect read alouds for my new group of 2nd graders in the fall! The series is about a ten-year old boy named Akimbo. He lives on the edge of an African Game Reserve where is father works, and he is a boy who cares deeply for the wildlife around him and who isn’t afraid to do what he can to protect them. 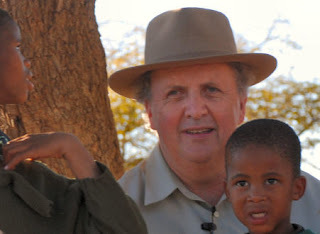 In reading about the different adventures Akimbo gets involved in, children will learn a lot about Africa, endangered animals, and the ability of one person to “make a difference.” The four little books (a 5th one is available in the UK!) are beautifully illustrated by LeUyen Pham, and are delightful reads. The audiobook versions are equally as delightful because they are read by Alexander McCall Smith himself. This entry was posted in Africa, Audiobooks, Children's books, Favorite authors on June 26, 2008 by Robin. The cover of that book is quite a grabber — soooo pretty! I just looked for an audio of his books for my long drive home from OK, yesterday, but couldn’t find any. Darn. I need to read more by McCall Smith. His books are wonderful. Cdnreader, I just finished listening to the fourth book (Akimbo and the Snakes) and enjoyed them all. They would be great to read aloud and discuss the ideas. Akimbo is a wonderful character. Nymeth, I hadn’t heard of it, either, but I thought they were terrific. Bookfool, I read two of them and listened to the other two (found the audiobooks at my library). They were fun to listen to, so I’m sorry you couldn’t find them for your trip home from OK. I agree–his book are wonderful. I’m planning to listen to his first in the Aunts children’s series. Haven’t read this one, though. My 9 yo loves Akimbo and the Snakes. I didn’t realize it was a series. Thanks for the heads up – he’s going to be excited to know there are more Akimbo books. Nan, I’ve read one of the Aunts books, but not the whole series yet. He also has a little mystery series out called Max and Maddy. I’ve put some of them on hold at the library. I’m delighted that he’s writing for children. Susan, I’m sure your son will enjoy the other books in the series. I’m excited for the 5th book to be released in the fall.